We currently have Saints available for adoption. Welcome! 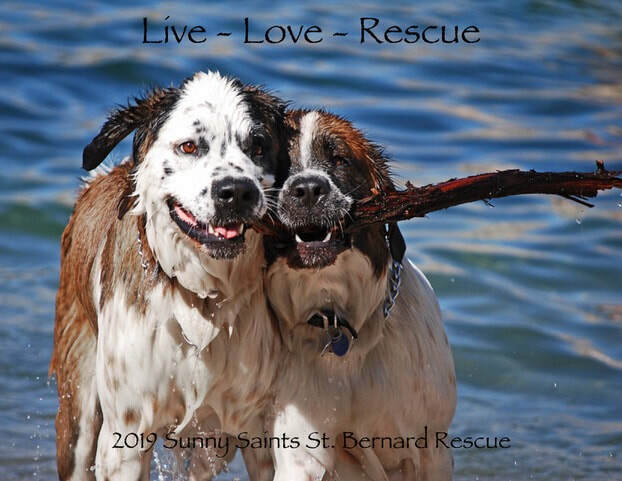 Sunny Saints St. Bernard Rescue is a 501(c)3 non-profit, all-volunteer organization dedicated to rescuing and rehoming adoptable lost, abandoned, or surrendered Saint Bernards. If you are considering adopting a Saint Bernard, we hope you will consider adopting from Sunny Saints. Please explore our site. 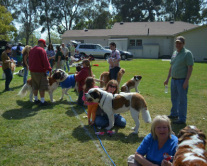 There is a lot of information here to help you make an informed choice about adopting a Saint Bernard. We get new Saint Bernards quite regularly. We only list Saints ready for adoption. The Saints listed here may not represent all the Saints we have. Unlisted Saints are typically still being evaluated in their foster environment, others may be recovering from illness, injuries, or medical procedures. Please check in often to see our new arrivals. You can also stay up to date on all things Sunny Saints by following us on Facebook, Twitter, Instagram, YouTube, AdoptAPet, and PetFinder. If you have any questions please contact us. We'd like to extend a special thank you to our many sponsors and donors! Without supporters like you, we simply could not exist to rescue this wonderful breed! Sunny Saints has teamed up with extraordinary artist Tina Taylor to offer custom artwork of your pet(s) for a special rate that also benefits Sunny Saints. She has done several works for us already and the results have been amazing! The Sunny Saints online shop is always open. Currently we are offering the 2019 calendar, shirts, and hats. All proceeds from sales go to support our Sunny Saints in need! Sunny Saints is always out and about. The annual picnic is Saturday, May 11. Check our Events calendar for the latest information of where will be next.